Light hearted poker tournament against famous characters. Is there a better alternative to Imagine Poker? Is Imagine Poker really the best app in Card and Board category? Will Imagine Poker work good on macOS 10.13.4? Imagine Poker... 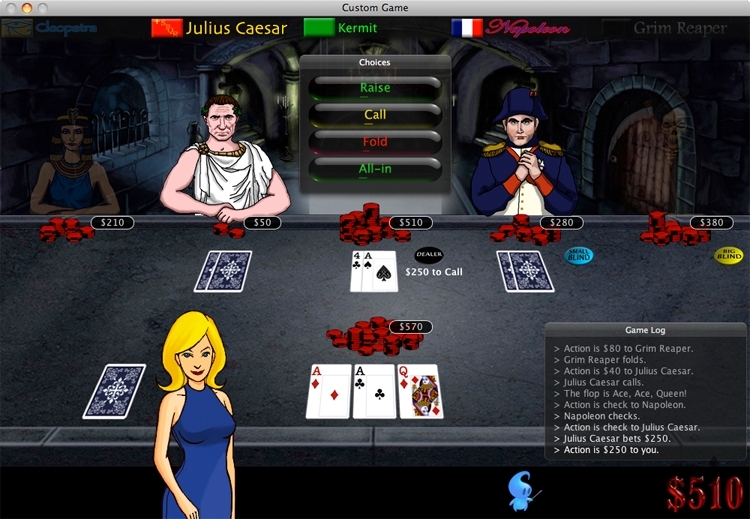 Play Texas Hold 'Em Poker on your Mac against 21 beautiful and fully animated characters that include Cleopatra, Julius Caesar, Napoleon, Genghis Khan, Dracula, Sherlock Holmes, Abraham Lincoln, the Tooth Fairy, Stalin, Robin Hood, Blackbeard, Merlin, and 8 more! Even the Abominable Snowman traveled all the way from Kathmandu to participate in the Imagine Poker tournament! Imagine Poker needs a rating. Be the first to rate this app and get the discussion started! Configure your Texas Hold 'Em game with any rules and settings you like and then enter a five round tournament where you must beat all of the characters to win! Imagine Poker features Candywriter's acclaimed artificial intelligence module that is sure to challenge even poker professionals. Create a profile from scratch and represent any country in the world. Then watch as Imagine Poker tracks detailed statistics of your games, ranks you in a Leaderboard against all of the other characters, and even grades your performance! Now use an "avatar" to represent you at the table. Which Imagine Poker character best represents you?